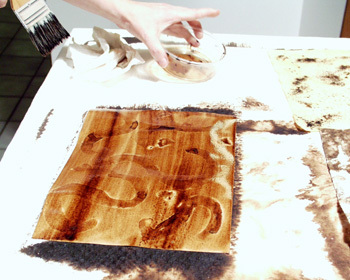 Bleach can be used very successfully on top of the walnut ink to create even more texture and light areas. Here we are using a different approach by painting the bleach in a design on the dry paper and letting it dry. The walnut ink is then applied on top of the bleach and we found that it creates darker areas where the bleach and the walnut ink mix. See the photos for the step-by-step instructions. FRESH bleach was painted on dry paper. Do not use good brushes for this! The bleach will degrade the brush's bristles unless the bleach is quickly washed off. Debbie painted over the paper after the bleach had completely dried (a heat gun was used to speed up the process). This is how the paper looked after being painted over with diluted walnut ink crystals. Another view of the paper: you can see the dark marks that are left by the dried bleach.